In the middle ages very few original studies were carried out, since it was the prevailing view that Aristotle had already discovered and described everything there was to know about natural history. However, a number of Arabian scientists, as well as some monks in Italy, Britain and elsewhere, translated and preserved classical studies such as Aristotle's, and conducted limited investigations in natural history. 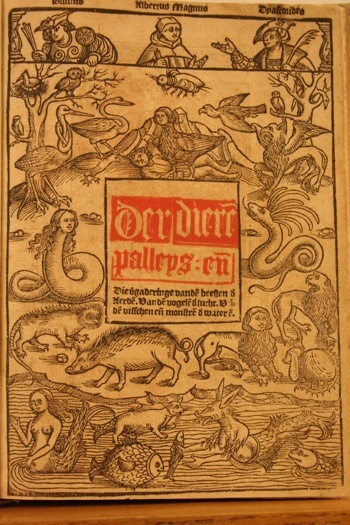 During this period bestiaries or "books of beasts" where popular. Around the seventh century, Isidore of Seville wrote his Etymologiae, an encyclopaedia of which part was about animals, derived from the books of Classical authors such as Pliny the Elder. When the Classical book "Physiologus" combined with the Etymologiae and other texts, the book known as the bestiary was born. The bestiary, or "book of beasts", is more than just an expansion of the Physiologus, though the two have much in common. The bestiary also describes a beast and uses that description as a basis for an allegorical teaching, but by including text from other sources it goes further; and while still not a "zoology textbook", it is not only a religious text, but also a description of the world as it was known. Saint Isidore of Seville (San Isidoro de Sevilla) was Archbishop of Seville for more than three decades. He was a compiler of existing knowledge rather than an original thinker, but his writing was influential for ages. Most of the twelfth century and later manuscripts quote from Chapter 12 (De animalibus) of that work. Chapter 6 De Piscibus is about marine and freshwater animals. An influential encyclopaedia and bestiary compiling all knowledge of natural history at that time. The book is one of of the texts in the links in a long chain of texts in which knowledge of the existing world of Antiquity that was handed down from Physiologus (see above). 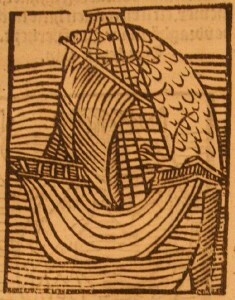 With Thomas of Cantimpré the number of descriptions had grown to several hundred. The encyclopaedia is build up by 20 books describing human anatomy, etymology, mythology, zoology, botany, mineralogy, astronomy, astrology, and meteorology. Marine biology subjects were treated in books 6 (marine monsters) and 7 fish, where the latter included some crustacean, molluscs and a sponge. A Flemish/Dutch translation of De natura rerum in the form of a long poem. 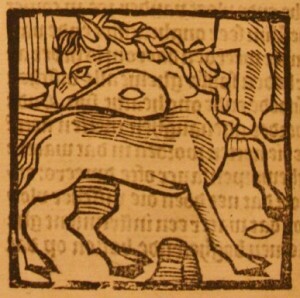 The text of Der Naturen Bloeme is distributed over eleven manuscripts, seven of them illustrated. Known for its vivid poetical language. The Hortus Sanitatis, the Garden of Health is a late example of the tradition of bestiaries. It is a rich compendium of information and misinformation which combines elements of natural history with those of the herbal. 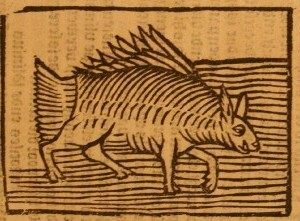 The animal section is particularly interesting with woodcuts and discussions of all manner of mythical as well as real animals. Translated in many languages. Der Dieren Palleys ende die vergaderine van den beesten der Aerde Van den vogele der lucht van den Visschen ende monstren der wateren. 1520 (2 1667). Based on Hortus Sanitatis with the same woodcuts. Chapter de Animalibus contains 160 terrestrial animals, 120 birds and 106 marine animals. 124 pages with 382 different woodcuts.